I had a strange issue come up recently where mail administrators were unable to allow Exchange to pick which mailbox database to place users into (I’m not quite sure what this feature is called so we’re going with automatic load balancing) when they were creating new user mailbox profiles. This feature essentially picks a database at random as a way to balance and spread out mailboxes among databases. Makes, sense to me. Anyway, I’m thinking we may have installed an update that changed the behavior because this feature had apparently been working up until we installed Rollup 5-v2. So it appears that this update had broken this automatic mailbox load balancing functionality, although I’m not 100% sure. I just wanted to mention it in case some of you are looking for clues as to why this is happening. So here is what the error looks like when allowing Exchange to choose which database to use when a new user is initially created. Error: Load balancing failed to find a valid mailbox database. Hmm, okay. That is weird. You can check to see if the database is set to be allowed with this command. In my case, all of my mailbox databases came back true, so they are unable to be used for automatically selecting a database when the user created. To fix this, go ahead and run the following. 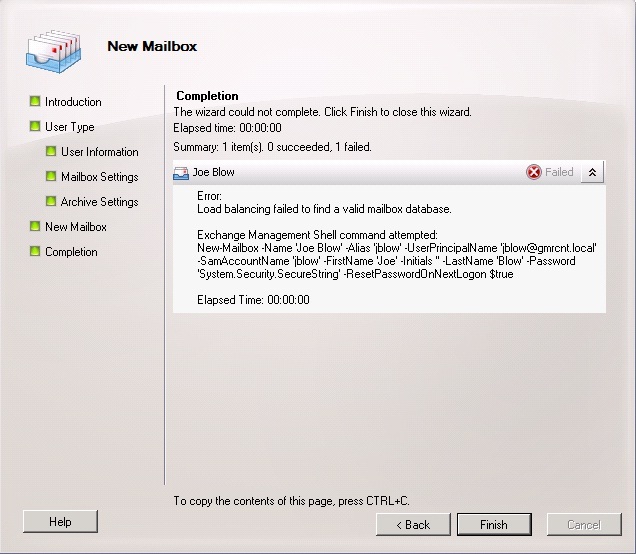 Now go ahead and run the first command again and you should see that all the mailboxes are now marked as false, meaning they are now included in the provisioning process. Now you should be able to go through and create without selecing a specific mailbox. My best guess is that the update must have set this flag to exclude these databases from provisioning but is weird and is worth mentioning because it happened to cause some seemingly unexplained issues for us.